We are doing what we love. From conviction and tradition. 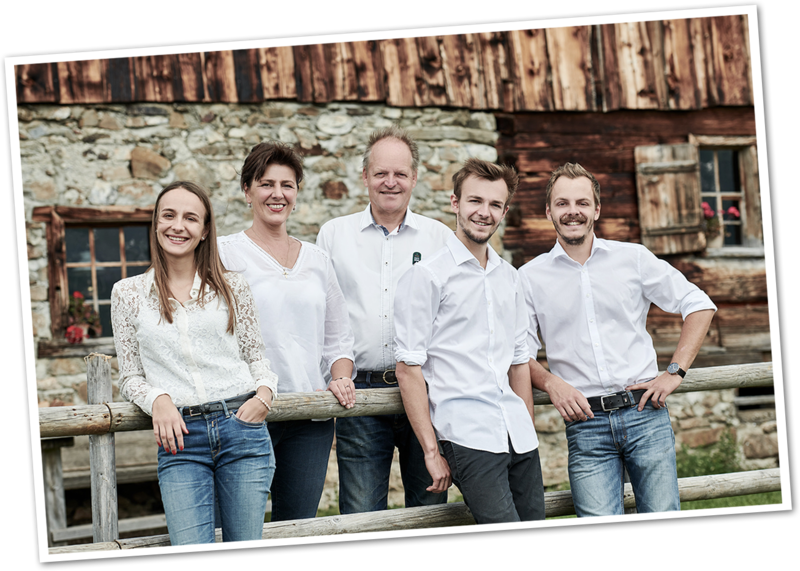 As "the young ones", we see the Mohnenfluh, which we are able to manage with joy as the inheritance we have received from Heinrich and Grete Muxel , as our home and our vocation at the same time. We are always led by a certain gratitude, being able to live and work in such an impressive place, and so we meet our guests with respect and offer the kind of hospitality to which people respond quite naturally. Our house has grown with joy – and so have we. At every stage, we confirmed our dedication to our Mohnenfluh and our life as hosts at 1,750 m above sea level. And this has obviously inspired our three children. Marie-Theres (born 1994), Martin (born 1996) and Johannes (born 1999) have also chosen a future career in tourism, one of the best industries of our time. The human perspective and recreation, closeness to nature and community can be experienced wonderfully here – and for generations, this has been the lifestyle of our family. We look forward to welcoming you here soon. Home. Refuge. Full of new experiences. In more than 55 years, the Mohnenfluh has developed into a very special place. Pampered by the sun and close to nature, our house is located in magnificent mountain scenerythat has always fascinated us and our guests. Powerful and striking, the landscape presents an Alpine idyll, giving us a feeling of tranquillity and inviting us to get to know it at close quarters: the lightness of a sunny day, the splendour of winter and the rich plenty of summer. We have taken care to furnish the rooms and suites, the lounge and the Mohnenfluh-Vital spa elegantly with choice items and valuable materials from our home region, to combine the traditional with the modern and to bring our heritage to join our vision of the future. In this way, we have created rooms with character and expression. With atmosphere – as unique and relaxed as our guests, who mostly decide on the first day that they would like to be with us again next year. And reserve time for themselves in a house that follows the rhythms of nature, that lives up to the Alpine natural surroundings marvellously and yet dispenses with all unnecessary trimmings. Here you will find time, here you will find leisure and adventure. Here you will find yourself. here you will find leisure and adventure. Here you will find yourself. and is still capable of such natural and harmonious development is a piece of home for all those who have made it what it is," says host Raingard Muxel. And it's true: in the Hotel Mohnenfluh, regular patrons meet long-serving staff. The family is supported by and relies upon an experienced, established team, which is in turn able to approach the Muxels with any questions and requests. Mutual give and take, balanced and respectful working together, is the distinctive feature of the Mohnenfluh employment culture. 60 hands are looking after a mere 50 guests, whom we also like to see as friends. Starting with a sincere "Grüß Gott" from our head of reception, Sarah Soraperra. Our chief service manager Ivett Ilias, our majordomo Marian Podgorac and housekeeper Vidanka Prolic are, for many people, well-known and much-loved faces, with smiles that are well-remembered. The cuisine of the Mohnenfluh also remains in the memory, created by our chef de cuisine, who has an excellent understanding of how to refine simple dishes and make exquisite foods simply enjoyable. We and our team look forward to meeting your wishes. A HOUSE LIKE A HOME. A team like a family.